A sampling of Kenneth Kortemeier's rustic Windsors. Country Workshops' 2016 class calendar has been trimmed to one tutorial a month, with classes scheduled from April through August. 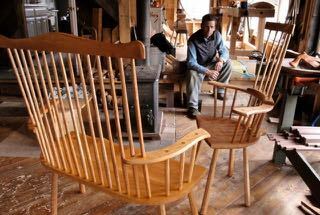 All tutorials are now full, except for the July 11-16 Rustic Windsor Chairmaking course, which has 2 openings. This class will be co-taught by Drew Langsner and Kenneth Kortemeier. Kenneth is the only person to have apprenticed with Welsh chairmaker John Brown. This is a special opportunity to really dig into the meat of what vernacular windsor chairs are all about. And maybe we will get Kenneth to share some good John Brown stories. As with our other tutorials, registration is limited to 4 students. Our summer intern will also participate as a class member. Regarding the fully enrolled tutorials. If you're interested in taking one of these, and can come on short notice, we'll be happy to put your name and contact info on a waiting list. We can never tell when there might be a cancellation. Summer 2016 courses will be tutorials; small classes limited to 4 registered students, plus our summer intern. Drew Langsner and Kenneth Kortemeier will share the teaching responsibilities. Registration can be by phone (828 656 2280), e-mail, or post. The tuition deposit for 5- and 6-day tutorials is $350. The tuition balance is due 4 weeks before class. We accept personal checks, Visa/MasterCard and money orders. 2016 CATALOG. Country Workshops' 2016 print catalog is now available. If you're on our mailing list you should have one about the time that this newsletter is distributed. If you don't receive a catalog by the end of February and would like a free copy (US addresses) send us an e-mail with your name and postal address. You can also print the entire catalog using the PDF link on the home page of our web site. Country Workshops tuition includes class materials, use of our high quality specialized tools and equipment, lodging in your private room, and our quite famous garden-fresh meals. This is also an excellent opportunity to try the tools offered at the CW Store. Full classes have a waiting list in case of cancellations. 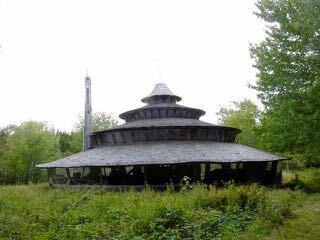 Coperthwaite's large living and work yurt at Dickinsons Reach in Machiasport, Maine. 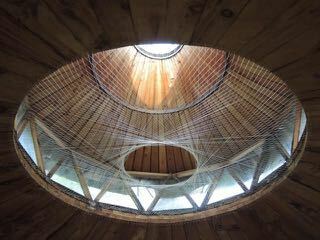 Interior detail of the yurt. Half-log bowls made by Beth Moen. Bench planks for knock-down shaving horses are in the background. 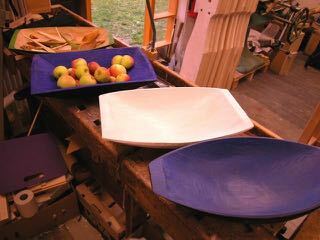 Almost anyone reading this newsletter already knows about Wille Sundqvist, the Swedish craftsman who helped to bring sloyd craft to North America. Wille taught Country Workshops' first ever classes back in 1978. But we may have never met Wille Sundqvist if not for Bill Coperthwaite. In the early 70s Bill was wandering around rural Scandanavia, on a quest to learn about traditional crafts, and also the lifestyles of people who made things by hand. His intuition and philosophy was that handcraft and lifestyle are interconnected. After returning to the U.S. Bill attended Harvard where he earned a doctorate in education. During that period he also began to develop his inspiration for a structure to live in that could be made with hand tools, natural materials and minimal expense. He began with the idea of the cylindrical yurts made by nomads of central Asia and translated it into something quite different, with outwards sloping walls, and a conical roof capped with a skylight. During the following decades Bill was instrumental in the creation of many yurt variations. Additionally, he also thought of these yurts as vehicles for group learning of skills with hand tools and exploration of ideas for how to live in harmony with the earth. You can learn much more about Bill's ideas for living and design from his book, A Handmade Life. Bill Copperthwaite passed away in an auto accident in 2013. A recent e-mail from our friend Peter Lamb tells us about The Wille Sundqvist and Bill Coperthwaite Sloyd Fellowshiop. The Fellowship has three objectives: to recognize some of the bright stars working handcraft with natural materials, to encourage international travel to strengthen the worldwide community of craftspeople, and to provide a stipend to help recipients explore new ideas and connections. The project was initiated as a collaboration with Jögge Sundqvist. Country Workshops will work with the Fellowship in implementing the program as it develops. There is no Fellowship Office or an Application for Fellowships. We are not looking for Fellowship volunteers. Instead, we are hoping for collaborative relationships with those folk schools, craft workshops, other nonprofits, etc that would like to be part of the Fellowship program. We will come to the recipients based on our connections and experience. The inaugural Fellowship has been awarded to Beth Moen of Siljansnas, Sweden. Beth has worked with wood for 35 years, making furniture and green wood crafts. She teaches at Saterglantan, Sweden's premier institute for sloyd and craft, in addition to having a woodworking business with Anneli Karlsson producing many items, including shaving horses, chairs, coopering, shrink boxes, carved half-log bowls and more. Beth says "I love and respect the big trees that have grown for ages, before they become my material. I am fascinated with simple tools and what you can do with them. My favorite tool is absolute the axe, so I am very happy chopping bowls." Two additional Fellowships have been awarded: to Owen Thomas and JoJo Wood of the UK. Owen is a professional pole lathe bowl turner. JoJo has specialized in spoon carving; she is currently training in clogmaking. The CW Newsletter will provide follow-up information about the Fellowship. 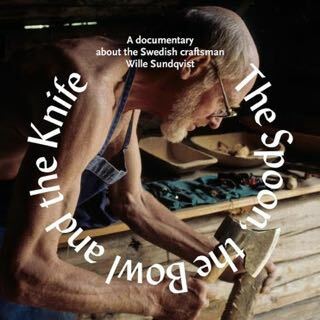 This is the DVD produced by Jögge Sundqvist about his father Wille Sundqvist. After the first run of 1000 copies were sold there was a question about whether or not to produce another run. We have been receiving quite a few requests, so we are particularly happy to have these available once again. It's an impressive package, providing a good impression of Wille's home and workshop, some family history, and then the main focus which is a spoon carving lesson from this master craftsman and teacher. The different grasps are shown, and there is a linked pdf file which also explains the grasps in detail. As a bonus, there is a section on how Wille turns and then engraves bowls of many sizes -- one of his other life-long passions. The dvd opens with a menu where viewers can select the Swedish or English language version. Country Workshops also recommends Wille's instructional book, Swedish Carving Techniques. This is an English translation by Taunton Press/Fine Woodworking of the Swedish original, Talja med kniv och yxa from 1988. Hans Karlsson in his shop. When we first visited Hans and Carina Karlsson in 1991 their business was located in a small cinder block building situated next to their modest home on a two lane road out of Motala, Sweden. Drew and Jögge Sundqvist were hosting CW's first international craft tour, taking our group from Stockholm to Oslo. Jögge had learned that the Karlssons were almost on our route, so we scheduled a visit. Hans took us to see the beautiful door hardware that he had recently made for an ancient church in the area, and then Carina invited us to have lunch with the family. That's when we also met two rather shy boys named Andreas and Johann. Although we already owned a good selection of gouges (mostly Swiss Made Pfiel) Drew bought a few to try out. Back at Country Workshops Drew reported on the tour, showed slides, and got out the Hans Karlsson tools. Almost immediately, friends and students asked if they could purchase them. That was was the beginning of the Country Workshops Store.
. . . Anyway, to make a longish story much shorter . . . Back in 1978 when we started Country Workshops with two 5-day classes taught by Wille Sundqvist, almost no one in North America had any idea about traditional Scandanavian handcrafts. What was so great about carving a spoon or hewing a bowl from half of a log? The interest caught on slowly. Maybe it was gestating. At the Karlsson shop there was never quite enough business to moderately support the family. Hans would take on outside jobs repairing factory machinery, and finding time for long Swedish vacations wasn't a problem. 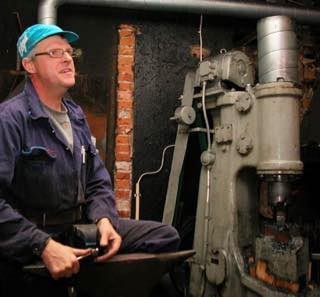 As recently as a few years ago Hans and his sons took on a job restoring a steam locomotive that was originally made in Motala, their nearby city. Suddenly, in the last few years there has been a super-nova explosion of interest in sloyd crafts, and with this an interest in the tools. The Karlsson (and also Svante and Elsa Djarv) toolmaking businesses were totally unprepared for a situation where everything is pre-sold before the making. Neither outfit wants to become a factory. These people are toolmakers; they are not management and finance executives who primarily want to grow a business. Production is now always running behind. Country Workshops places large and larger orders with the intention of having inventory on hand for our customers. But, of course, our larger orders take more time to make. Our recommendation is this: After researching the tools that you want (or need!) go ahead and place your order. This puts you in line for when the tools get to Country Workshops. Although we prefer payment by check, if you use MasterCard/Visa we won't run the charge until we are packing your tools. If you become inpatient, you can always cancel. Over the years we have also learned that the best tools are often the best value. And in the old days (years or centuries) tools were never easy to come by. They were treasures of the craftsmen who used them. 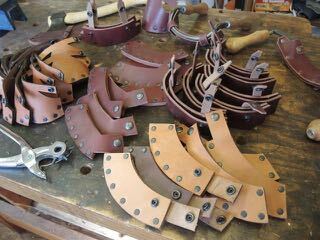 Over the past 20 years or so several craftsmen have made the leather guards for the hand tools that we offer. Our first guard maker was Cecil Self, an old-time country harness maker in Afton, Tennessee. Cecil made and repaired harnesses for the US Cavalry during World War II. Cecil and his brother did their own oak bark tanning until about 1970. It was always a treat to visit Cecil's workshop which was a real historic treasure, although known only to a few local folks and family. Andy had the idea for cutting the leather pieces with a laser. The advantages are speed and uniformity from one piece to another. The laser work is out-sourced to an Asheville photographer who has a digitally controlled laser to produce scenery props for his photos. The laser also leaves an attractive blackish burn on the cut edges. Laser cutting makes production more efficient, and we are hoping that Andy will continue with the guards into the future. Most recently (in the same leather guards department) our long time suppliers Hans Karlsson and his sons Andreas and Johann have begun to produce leather guards for their axes and adzes. Our very popular sloyd axe (H-166) and the short handled standard adze (H-162) now come to us with leather guards from the Karlssons. A leather guard is not included if you purchase the H-161 adze head (without a handle) or the H-164 Windsor adze head. These will continue to be made by Andy. You can see the selection and pricing on our web site.